KANSAS CITY, Kan. — If you saw a list of people Vincente Valdivieso impacted, you’d never know his life was cut short at just 12 years of age. “I know deep in my heart as much as it hurts . . . he did his job on earth and succeeded in the 12 years [in a way] most can’t even complete in a lifetime,” said Angela Rodriguez, Vincente’s mom. “And I know that God needed him to watch over us, since his job was done here,” she added. Vincente, a student at Christ the King Church in Kansas City, Kansas — known fondly as “Vinny” — passed away from asthma complications just months after completing sixth grade. Luis Pineda, Valdivieso’s basketball coach from third- through sixth-grade, said the loss was a big one for his team. So Pineda wanted to find a way to honor his former player. 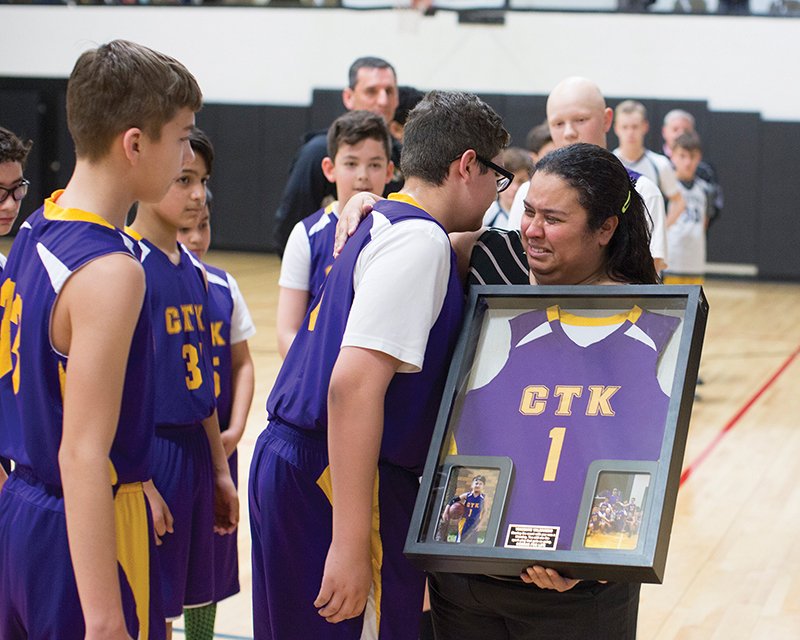 “I asked the boys, ‘What do you think would be a cool idea to do something for his [family] and for basketball?’” Pineda said. The players came up with the idea of retiring Vincente’s jersey at one of their games, framing it and presenting it to his family. Pineda was touched by the idea and scheduled the ceremony for right before the team’s Feb. 3 game against Church of the Nativity’s team at Bishop Ward High School in Kansas City, Kansas. Pineda asked Nativity’s coach if his team would like to be there to support the boys as they presented Vincente’s family with the jersey, and the latter quickly agreed. “They even came over and gave condolences when we were done, which shows what a class act that school was,” said Pineda. The boys presented the jersey to Angela, who walked onto the court with one of her three daughters. Although Vincente’s father Frankie was unable to attend the event, the entire family was grateful for the ceremony. “Vincente’s teammates honoring him in this way was so touching, it still gives me chills,” said Angela. “It was an honor that his jersey was retired because he has worn the same number for many years, since he was so small in stature,” she continued. “He would make you smile,” said Pineda. If the team would get down after losing a game, Vincente was there to brighten their spirits. For Angela, receiving support from the team her son treasured meant the world. “I know Vince had a heart of gold when he was on the court and loved what he did,” she said. “He was a tough little guy that always tried to push [himself] to make it for the team,” said Angela. The team felt Vincente’s presence particularly during the jersey retirement game. “We had our best game of the year,” said Pineda. The team lost, but only by six points; Nativity had defeated them by 20 points the last time they competed. The game drew a large crowd from the Christ the King community, which was inspiring for Pineda. “I know now I have made the right decision on sending [my kids] to a Catholic school,” she said. From the jersey retirement to the kind words she’s heard from students and teachers, Angela finds hope, knowing her son lived a full life. “I am ecstatic that my little guy touched so many hearts,” she said.